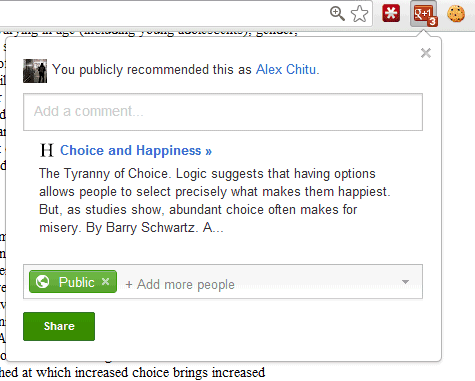 Chrome 22 (currently in the Dev channel) has a cool feature that lets you set keyboard shortcuts for extension buttons. Just open the extensions page (click the wrench icon, then select Tools and Extensions), scroll to the bottom of the page and click "Configure commands". You can enter shortcuts for all the extensions that use browser actions, a fancy name for the buttons displayed next to the Omnibox. 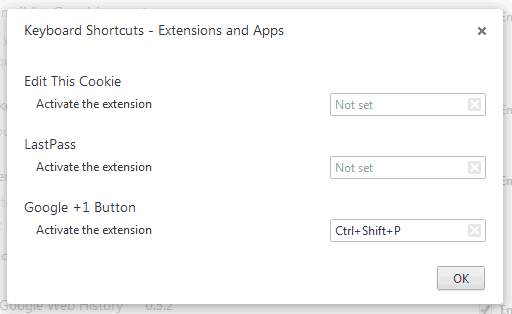 Right now, you can only set shortcuts that simulate clicking the buttons, so they're not useful for all extensions. For example, they're useful for the "Google +1 Button" extension because you can quickly +1 pages, but they're not useful for the LastPass extension because it only displays a long list of options. There's an experimental Chrome API for extension developers that allows them to add keyboard shortcuts that trigger actions and it's likely that users will be able to customize these shortcuts. Some shortcuts that work: Ctrl+Letter, Ctrl+Digit, Ctrl+Shift+Letter, Ctrl+Shift+Digit. You can even override standard shortcuts like Ctrl+T, Ctrl+C or Ctrl+P, but you shouldn't do that. If you want to check out a cool new extension, try www.chatterati.in. It gives every webpage its very own discussion forum! This is a good thing, creating shortcuts will allow easy access to Chrome. I will follow this post to create shortcuts to ease my job. Does anyone know how to remove them too? I tried it but now i can't find a way to delete them. will be fixed on the next release. same here - any solution?